Leo Burnett has partnered with Procter & Gamble (P&G) to host an art exhibition based on the 'Capital Clean Up' programme that has been taking place across London in the lead-up to the Olympics. The exhibition, entitled 'Helping London Look Its Best,' opens this week at the Brick Lane Gallery, east London, and will run until the first week of July. It features illustrations from London artists created around the theme of cleaning the capital in time for the Games. 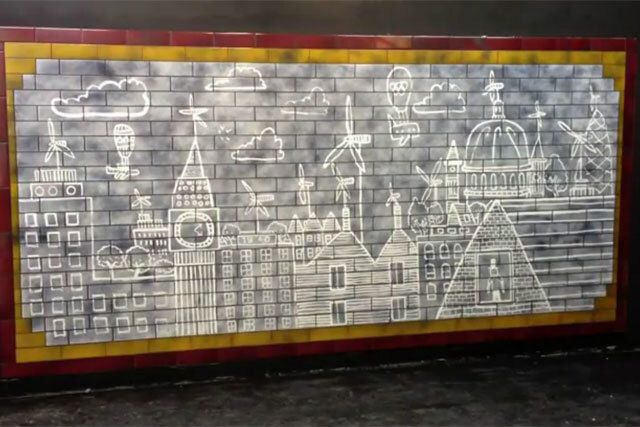 Each artist has been given a dirty wall tile from the London Underground to create an image with, by cleaning the tile with a cloth or their fingers. P&G's 'Capital Clean Up' campaign, which is run in association with Mayor of London Boris Johnson and the Greater London Authority, claims to have cleaned around 10 square miles across 20 of London’s boroughs. P&G has also funded the production a TV show,' The Big Celebrity Clean Up', to be shown on Channel 5, as part of the campaign.